In a previous post, we discussed the importance of Fire Service Access Elevators or FSAE based on their ability to assist first responders in the evacuation of occupants in the event of a fire. These fire service access elevators are becoming more and more advanced with special requirements to insure the safety of operators during a high rise structure fire. Most of the requirements outlined in the previous post "Fire Service Access Elevators Explained", are found in the International Building Code or IBC. The FSAE sections include 403.6.1 and 3007.1 - 3007.9. However, in the State of California we go by the California Building Code or CBC. The only major difference spelled out in the CBC is the section on Fire Service Access Elevator "Phase 1 Recall". In the CBC the requirements for the Phase 1 Recall are as follows: "Activation of ANY initiating device within the building shall active the phase 1 recall of all fire service access elevators. All standard elevators shall remain in the normal operation unless they are manually taken over via key or the activation of their associated fire alarm initiating devices." Now as with most jurisdictions and AHJs, you will more than likely have to deal with local adopted ordinances. These are alterations to the adopted code by your AHJ. Once these ordinances have become officially adopted, they override the National or State Code. A perfect example of this is San Francisco's "Administrative Bulletin #5.08" better known as AB #5.08. San Francisco Fire Department (SFFD) has adopted this bulletin making it the new code. Where is the Requirement for Temperature Sensors in FSAE Lobbies? "An approved means for firefighters to monitor heat conditions in FSAE lobbies and associated machine/control rooms, such as analog heat sensing system annunciated at the Fire Command Center (FCC). This is intended to provide firefighters with more information to determine whether the FSAE protection has been compromised. This means shall include a dedicated FSAE Status Panel located at the FCC. (Reference NFPA 72-2016 Section 21.5 indicated in item 4.g below)"
This requirement is in place to give the first responders a live reading of the temperature present in a given fire service access elevator lobby before traveling to the area. This requirement makes the standard code found in the IBC section 3007 a little more complicated and costly however the benefits of life safety are worth it. You can see a screenshot of a Fire Service Access Elevator dedicated status panel in our previous article title "Fire Service Access Elevators Explained". How do We Monitor Heat Conditions Within the FSAE Lobbies? Each major fire alarm equipment manufacturer has their own method of accomplishing this feat however we am going to use Notifier as an example in this article. Notifier has an addressable monitor module known as the FMM-4-20. This module utilizes a 4-20 mA circuit to connect with 2-wire and 3-wire temperature sensors that produce a 4-20 mA signal output. Only one sensor can be connected to a FMM-4-20 module. The temperature sensors we have been using are the TW series from Veris Industries. 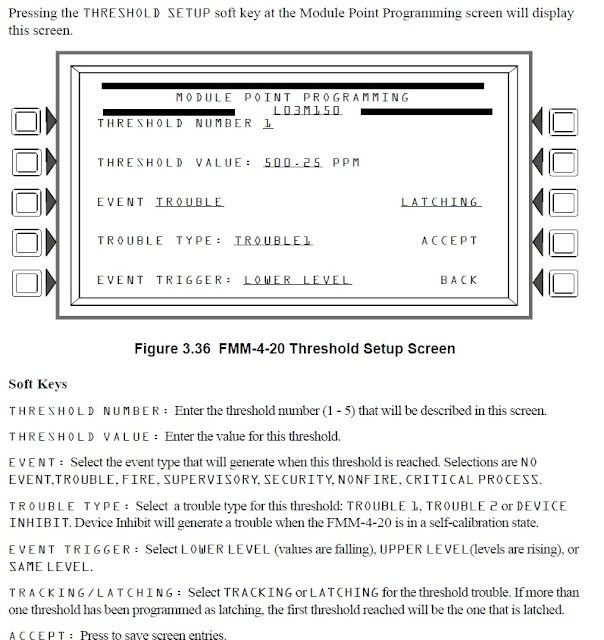 Below is a picture of the Veris Industries TE Temperature Sensor and FMM-4-20 wiring diagram. 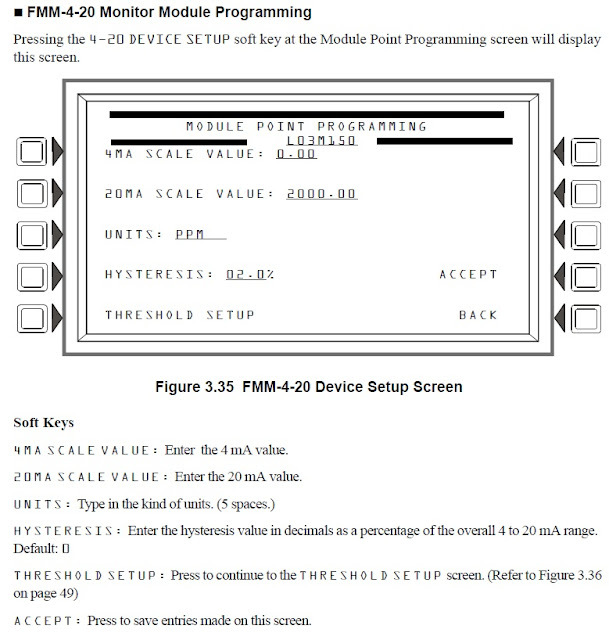 We are not going to get into too much detail on the programming of the FMM-4-20 module for the purpose of monitoring fire service access elevator lobbies, however, we have included a few notes and screenshots to show the setup and options. CBE positions 3 - 7 are assigned to FMM-4-20 threshold levels 1 - 5 respectively. (Threshold levels are user-programmed. Refer to “FMM-4-20 Monitor Module Programming” on page 48 of the NFS2-3030 programming manual.) Each will activate only if the device is currently at that threshold level. 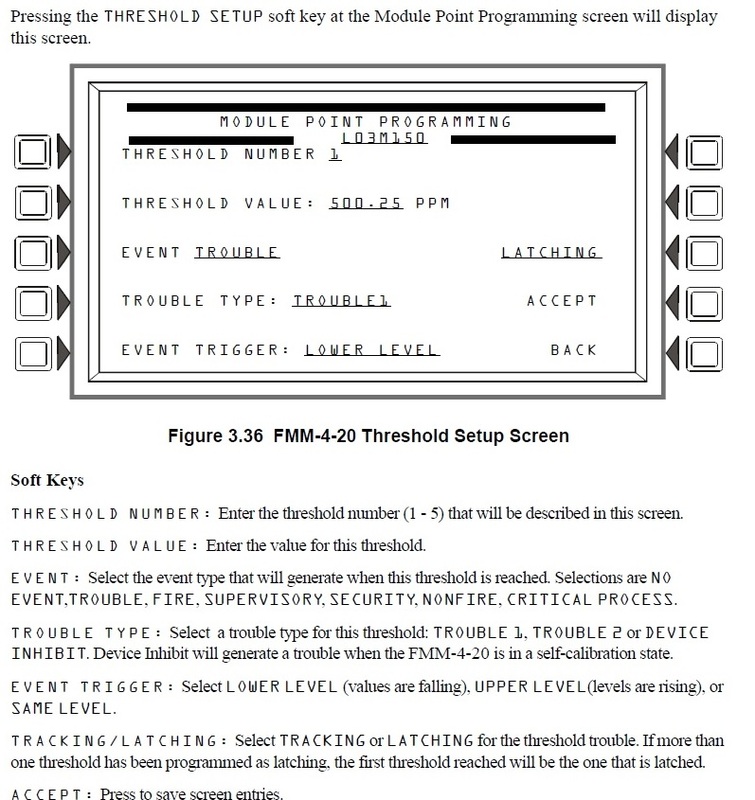 Once the device leaves that threshold level, the zone in its corresponding CBE position will remain active or deactivate according to whether its threshold is programmed for latching or tracking.